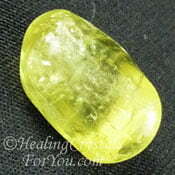 Heliodor were known in the past as magic stones, shiny pieces were used as seer stones. They have an excellent ability to create a connection between the energy of your mind and your willpower. Their vibration may help to trigger mental telepathy and may stimulate your creativity, through their action at the solar plexus. 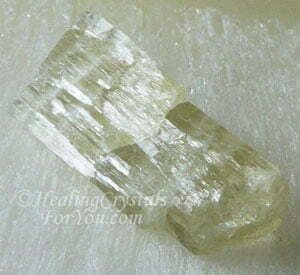 These crystals are the golden yellow variety of Beryl, which incorporates the vibration of the bright yellow ray within it. 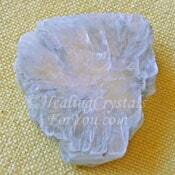 They strongly resonate within the crown chakra, which may motivate and energize your thinking. This connection helps you to move your life forward in the way that you desire. 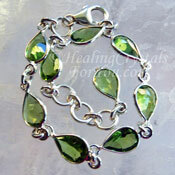 Their role as healing stones can help you in a number of ways. 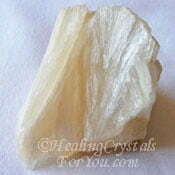 They are especially beneficial when you are lacking energy or when you are suffering from stress or anxiety. 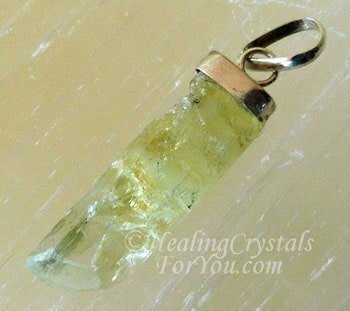 This lovely crystal is the yellow or yellowish green variety of Beryl, the color being caused by the presence of iron in the stones. 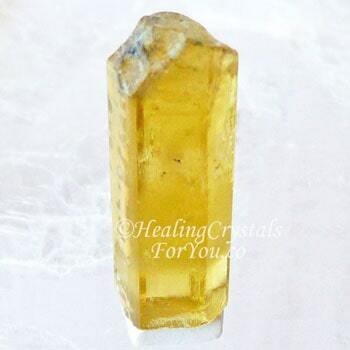 The name Heliodor is said to come from the Greek words "helion" and "doron" meaning "a gift from the sun", and is a trade name used to sell Golden Beryl. It is found in a number of locations, including in Sri Lanka, Namibia, Afghanistan, Pakistan, Brazil and Madagaskar, and is fairly easy to obtain. It shape is hexagonal also known as trigonal, and it is is common for the stones to have vertical or parallel striations on them, and some may have pyramid shaped terminations. 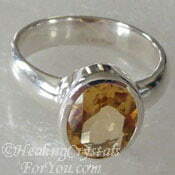 It occurs in a number of types including the flawless gemstone quality pieces that are made into high quality jewelry. 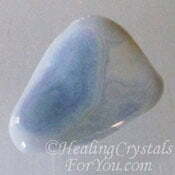 These stones resonate well within both the crown chakra and the third eye. 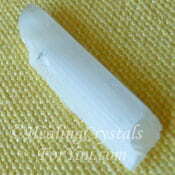 Used on the forehead near the third eye, you may find that its energy helps you to think more clearly. 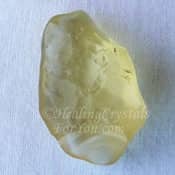 Heliodor has a good action to stimulate psychic communication, and may specifically aid communication between two people who are some distance apart. This gift is known as mental telepathy. Through its action to link the mind and the will, this creates a strong connection to empower you to allow the energy of Divine Will to bring about changes in your life. 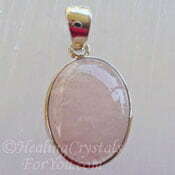 Its metaphysical properties are powerful, as they have a vibration that helps to create balance between the will and mind. These crystals have been known in the past as a stone of magic, and shiny pieces were used as seer stones for scrying by those with 'the gift'. 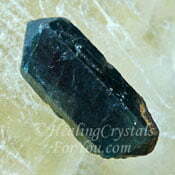 For those that don't know what scrying is, it relates to foretelling the future by seeing visions in a shiny surface. By using this stone to bring the power of intention into play, you may be enabled to accomplish those things you most aspire to. Of course the thing about intention is that you do need to take action yourself, you can't just sit around expecting that it will simply happen. A useful action may be doing regular visualization of what you hope to bring about in your life. 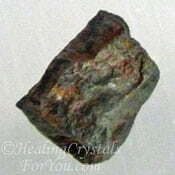 Regardless of that, the energy of this stone is effective to assist you to have a greater awareness of the direction in which to move to assist the flow of those things you desire into your life. 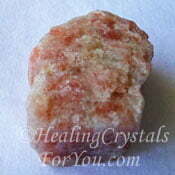 These crystals may also have a beneficial effect to assist with manifesting those things you desire. 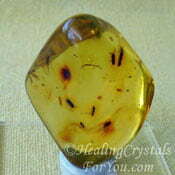 Because they vibrate within the area of the solar plexus, this may encourage your dreams and hopes to be realized. 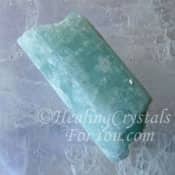 The energy of these crystals helps to soothe anxiety, stress and worry, so if you are feeling anxious, wearing this stone may be helpful. 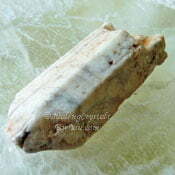 While it is simple enough to put a piece of this stone in your pocket, wearing jewelry made from a stone is an easy way to keep it within your aura. 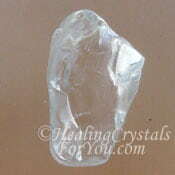 It may be advantageous to keep a piece on your body if you are working on stimulating your telepathic gifts. They work well when worn as earrings as this keeps the energy in the area close to the third eye. 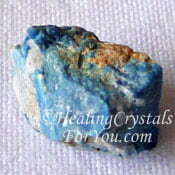 These stones are Leo birthstones so you may find this makes it easier to obtain jewelry made from these stones. 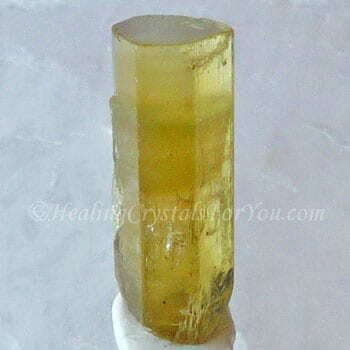 Look for them selling as either Heliodor or as Golden Beryl. 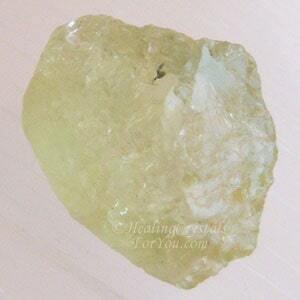 This bright yellow crystal embodies the golden ray. 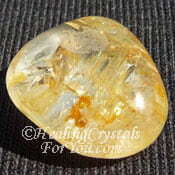 This is a highly stimulating vibration that resonates strongly within both the solar plexus and the crown chakra. The solar plexus is also known as the power chakra because it helps to stimulate your will power and may also increase your confidence and self esteem. 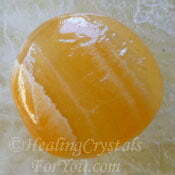 The solar plexus is the seat of the will and the crown chakra strongly relates to aiding effective thinking. So this combination leads to a potent outcome for enhancing your life. 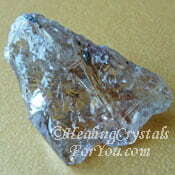 These crystal are highly beneficial to stimulate creativity, and may specifically boost creative thinking. 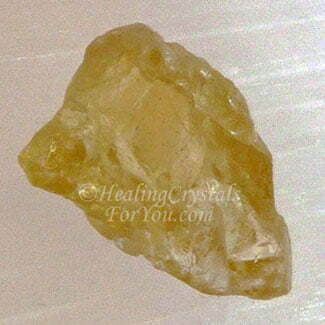 The vibration of Heliodor is known to be highly effective to assist the healing of organs within the area of both the solar plexus and sacral chakra. 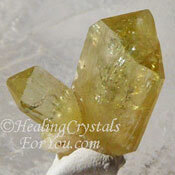 These yellow crystals also have a number of other beneficial healing attributes. Health issues within the liver, spleen and pancreas may benefit from its energy, including jaundice and bilious attacks, and it may help women during menopause. It is also reputed to assist elimination, helping kidney, bladder and digestive problems such as diarrhea and nausea. These stones are specifically known for helping you if you are very tired or lacking energy, and will help to relieve stress and anxiety. 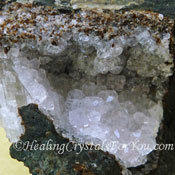 To help you to boost your telepathic gifts, it may be of value to use it with other crystals that also stimulate mental telepathy. Stones you might choose includes Golden Rutilated Quartz, Pietersite, Ulexite, Blue Apatite, Dream Quartz, Lazulite or Blue Chalcedony. 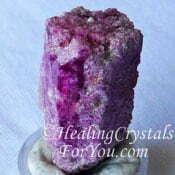 These are excellent crystals to aid manifestation when used alone, but to boost their energy even further you might choose to combine it with one of the other strong prosperity stones. Other excellent prosperity stones includes the lovely green Peridot, Citrine, Golden Topaz, Sunstone, Brazilianite or Libyan Desert Glass. This is a strong stone to stimulate your creativity. 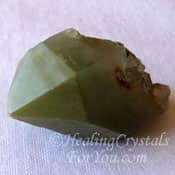 If you have a desire to boost your creative gifts it can be quite beneficial to use this stone with other stones that may assist your creative ability. There are quite a few stones that are effective for this purpose. This includes combining it with Amber, Analcime, Golden Rutilated Quartz, Citrine, Libyan Desert Glass, Yellow Apatite, Orange Calcite, Tantalite, Tunellite or Powellite. 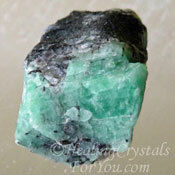 All of the crystals in the Beryl family combine well, and can be used together. There are in-depth pages written about quite a few of the colors of Beryl stone. 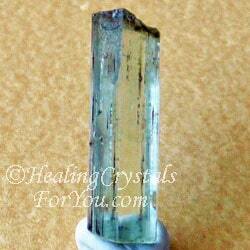 Many are well known, like Green Emerald and the lovely light blue Aquamarine. There is also the dark raspberry pink Bixbite, the lighter pink Morganite stone and the clear beryl called Goshenite.